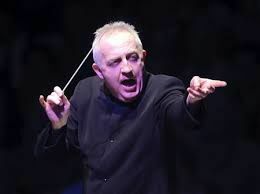 "Admirable, too, over at Orchestra Hall, was the [Chicago Symphony] subscription series debut of Bramwell Tovey, whose previous appearances with the CSO had been at Ravinia. The British-born, Vancouver-based conductor devoted his pair of concerts to two first performances by the orchestra: William Walton's "Orb and Sceptre" and the complete Act 2 of Tchaikovsky's "Sleeping Beauty" ballet. The ballet's second act contains some of the composer's richest mature invention and is hardly ever heard apart from dance performances; it made a refreshing change from the overplayed Tchaikovsky symphonies. An experienced ballet and symphonic conductor, Tovey drew a sumptuous reading from the CSO, and there were fine solo contributions all around. Concertmaster Robert Chen ably dispatched the nearly 10-minute mini-violin concerto Tchaikovsky wrote for the virtuoso fiddler Leopold Auer, years before the latter came to America to head the violin department of Chicago Musical College. As articulate in his spoken introductions as he is with a baton, Tovey made snappy work of the exuberant march Walton wrote for the 1953 coronation of Queen Elizabeth II. He also pulled out all stops for the British companion piece, Britten's "The Young Person's Guide to the Orchestra." This grand set of variations on a rondo by Henry Purcell was designed to display the mettle of each orchestral choir, and it fulfilled its purpose at the expertly led performance given Saturday.